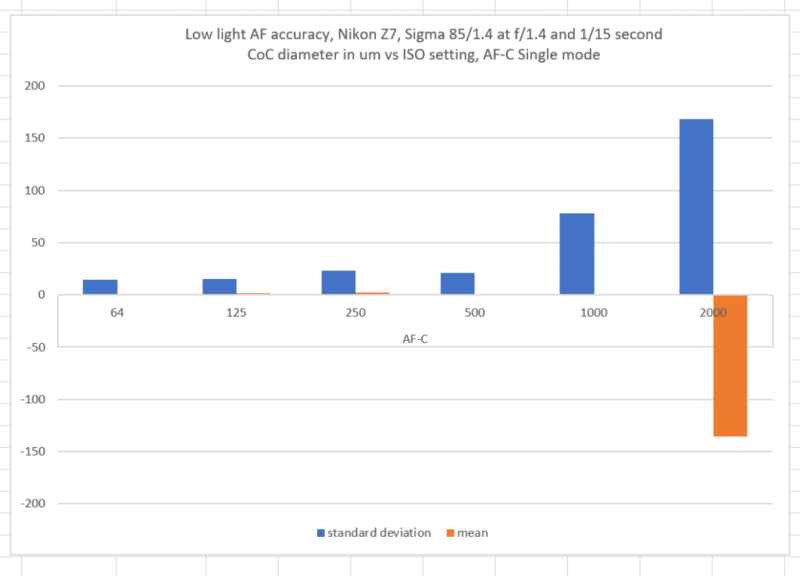 In my last post I looked at the Z7’s autofocus accuracy in dim light with the Nikon 105 mm f/1.4 lens. I controlled the light with a variable neutral density filter, and left the ISO setting at 64 as I made the image on the sensor darker, compensating by lengthening the exposure time. Marianne Oelund suggested that I redo the series, but leave the exposure time constant at 1/15 second, and compensate for the dimming projected image by increasing the ISO setting. 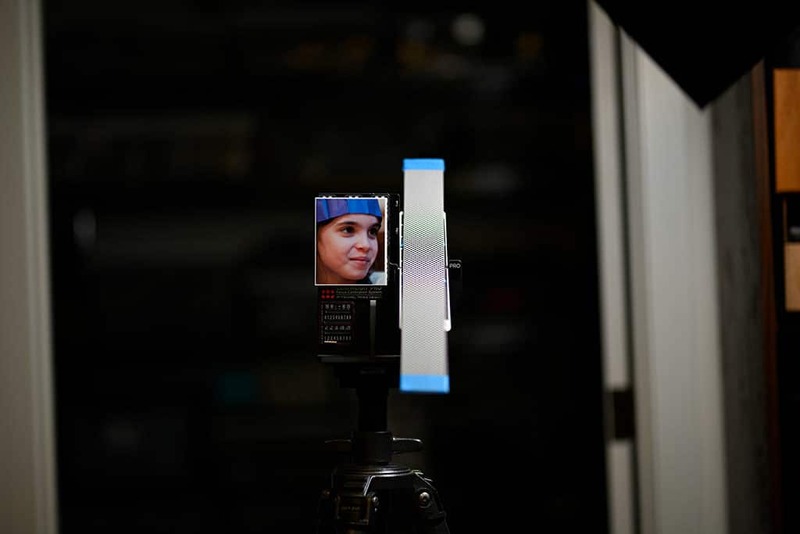 That would simulate the way the camera is likely to be used better. I mounted a Sigma 85 mm f/1.4 F-mount ART lens to the FTZ adapter, and attached the adapter to the Z7. I opened the lens up all the way and threaded a variable neutral-density filter on the front. I turned the filter to minimum, set the ISO to 64, the shutter speed to 1/15 and made a series of 16 exposures. Then I added a stop more density to the filter, doubled the ISO setting, and made another set of exposures. I kept doing that until the camera failed to focus. I made the captures in AF-S mode, Pinpoint spot size, with the priority set to focus. As I was setting up the camera, I noticed that the speed and apparent accuracy of the result was sensitive to the particular portion of the target area chosen for the focus point. I put the focus point on the camera-left eye of the subject, which seemed to afford the fastest and most-accurate focusing. I haven’t quantified — and am somewhat of a loss about how to quantify — this target dependency, and I have not done even informal tests in any mode but AF-S Pinpoint. 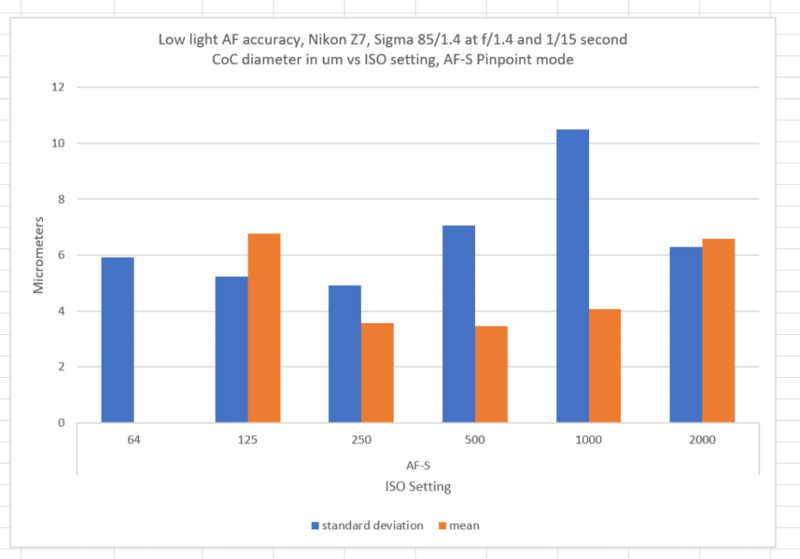 Accuracy is better and scatter is lower than in the previous series, even at the brighter (lower ISO) data sets. I’m putting this down to the location of the focus point. I wasn’t paying that much attention before (but I do know that I left it in the same spot for all the exposures in the previous post). 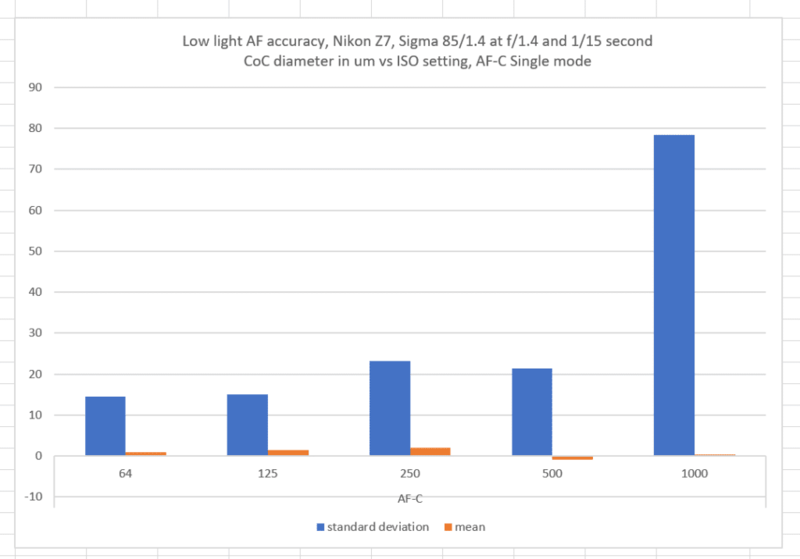 Accuracy and scatter are even pretty good at ISO 2000. Things fell apart in a big way t ISO 4000, and the camera only made one of the requested 16 exposures. The mean results are quite accurate. The scatter is higher than with Pinpoint (CDAF) mode. The scatter gets really bad in the dimmer cases when the CDAF focusing is still doing well. The dependencies on the target area are going to make theses tests difficult to reproduce.